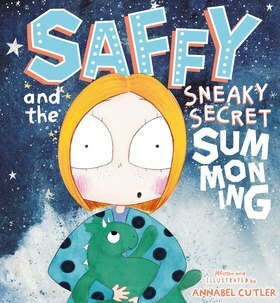 Annabel Cutler is an artist, student and the illustrator and author of Saffy and the Sneaky Secret Summoning, which marks her children’s book debut. Annabel is currently studying for a Bachelor of Communications Degree at University of Technology in Sydney and has completed a certificate in Illustration and Drawing at Open Colleges with a high distinction final mark. Her fine art is stocked in galleries throughout NSW and she has participated in a few group exhibitions. Having spent much of her childhood on a property in rural New South Wales, her passion for painting and drawing animals and quirky characters flourished and continue to inspire her today. Saffy’s strange and imaginative escapades were stemmed from Annabel’s own childhood fascination with magic and mythological creatures, dragons in particular. The story is brought to life through a vivacious series of playful, mixed media illustrations that capture Saffy’s quirky and determined spirit in scenes that are vibrant and exciting. When she’s not making a mess in her studio, she loves morning swims on the beach, documentaries and eating too much food with friends. Her work can be found online on http://www.anabelcutler.comand @annabelcutler on Instagram.